On Monday evening, April 11th, in the year 1831, eight men sat around a table in a little house on Front Street above Callowhill - 449 was the number. One of them, John Waters, who was the host, read from a book in which three and a half pages were covered with close, vertical writing and all the rest were blank. The book is at this moment by my elbow, and on those blank pages in varying handwriting, in cold terms of motions, committee-appointments, financial reports, has been recorded the heroic striving of a little group within the Church Catholic. While the reading was going on the others, in semi-darkness beyond the circle of light from the oil lamp, listened intently. Then there was discussion of certain pertinent matters, the determination on a course of action, and the assigning of duties. It was an historic meeting, the first meeting of the trustees of St. Michael's Parish. Two of these eight men were to be the outstanding figures in the American Church at the middle of the century. The one with a splash of purple above the waistcoat, a man with sharp, questioning eyes below a shock of curly dark hair, and with a general air of alertness and readiness for action was the Bishop Coadjutor, Francis Patrick Kenrick. He was not quite thirty-four years old, but already had had a distinguished career as a student at Rome, as a professor of theology at Bardstown, secretary of the Provincial Council of Baltimore, as a preacher, writer, and controversialist. By his frequent visitations of his immense diocese under most trying circumstances, the formation of parishes, the foundation of the seminary, the institution of a Catholic weekly, he was to make a splendid record in Philadelphia, and in 1851 he would be called to the archiepiscopal and primatial See of Baltimore. The other man, whose face was thinner and longer, set in an expression of serenity, with the straight black hair drawn well down on the forehead, was a simple priest, five years ordained, but several months older than the Bishop - it was Rev. John Hughes. It is scarcely necessary to remark that this name, with the possible exception of James Gibbons, is the most illustrious in the history of the American hierarchy. This man's tongue and pen would be greatly feared by Protestant polemicists. He was to be Bishop and first Archbishop of New York. His courage and determination would quickly put an end to the threat of Native Americanism in that diocese. He was to be the friend of Presidents, an adviser to the Secretary of State on the conduct of the Civil War, an ambassador extraordinary to the Court of Napoleon III. It was to be written of him by one of his successors that "he was not only a great ruler of an important diocese . . . but also a master builder of the Church in the United States, and one of the most helpful and sagacious of the makers of America." His charge at the time was St. John's on Thirteenth Street, and he was to serve as a trustee of St. Michael's only until the appointment of a pastor. The six other trustees were laymen: John Waters, Henry Crilly, Adam Miller, Patrick McBride, Hugh dark, and William Browning. The leaders of the Catholic group had, of course, met before this, and to one meeting held at the home of Thomas Love, on Pitt Street just above the Liberties' boundary. Father Michael Hurley had addressed a letter, which is to be found in the archives of the Philadelphia Catholic Historical Society. Incorporation had already been granted by the Legislature on April 5th; it was the charter of incorporation that was read by Mr. Waters. This charter, or "Constitution of St. Michael's Church", provided among other things that the bishop of the diocese should have full power to appoint pastors and assistants; that the bishop would be ex officio president of the Board of Trustees, the pastor ex officio a member, and that there should be six lay trustees, to be elected by the congregation annually on the Monday after Whitsunday - the six lay petitioners, who were the six present at this meeting, were to serve until an election; that the Board should fix the salary of the pastor or assistant priest; and should have full power to purchase ground and erect thereon a church, school, rectory, and also "to appropriate part of the lot for a cemetery." The ground which had been under consideration belonged to William M. Camac, Esq., and extended from Second Street to Hancock Street, and from Jefferson Street one hundred and forty three feet south. Before the meeting adjourned the bishop appointed a committee to obtain a deed for it. 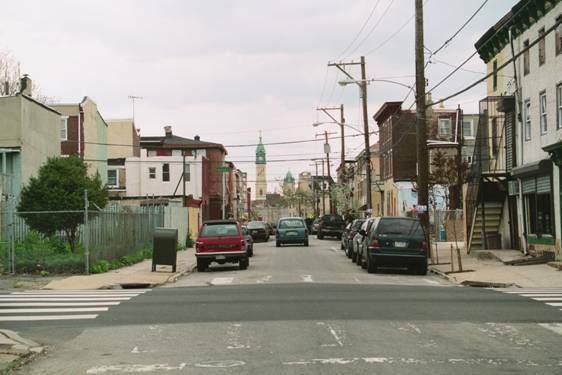 Catholics who have had the experience of living in a hostile community, of hoping and praying for the growth of the Faith about them, of dreaming for a long time of the building of a church nearby in which the Good Shepherd Himself would dwell, will have no difficulty in understanding the elation of these laymen or the joy which was spread through Western Kensington that night as the news was carried to one Catholic home after another. This ground was purchased for $3,333.00, and on June 12, in the presence of "about two thousand people or more". Bishop Kenrick blessed the cemetery. Lots of eight feet by nine were put on sale for twenty-five dollars, and smaller ones "in proportion." Every church had its cemetery in those days. There was in Kensington besides these the Palmer Burying Ground, which had been bequeathed to the people in 1749 by Mrs. Thomasine Keith, the daughter of Anthony Palmer. But for the City up until 1826 the only public cemetery had been the Potter's Field. The burial charges in some Protestant cemeteries were exorbitant; it is said that the wardens of Christ Church and St. James' presented bills of twenty and thirty dollars for opening graves, and would not allow a tombstone to be put up until all the money due was paid. These abuses led to the formation of burial societies, which purchased ground in Southwark and sold lots of eight feet by ten for $10.00. The price set by St. Michael's trustees seems high in comparison, but it conformed to the rate of other churches, and, of course, it was intended to bring helpful revenue. The interment charge was only $3.00 for those over twelve years of age, and $1.50 for those under this age; it was free to the poor. In March, 1832, subscription books were put out to raise funds for the erection of a church, but the collection went on very slowly because of the dreadful epidemic of cholera which raged in and about the City, and during which, it may be said in passing, the Sisters of Charity gave a beautiful and heroic exemplification of the charity they profess in their ministrations to the diseased at the Alms House and in the improvised hospitals at St. Augustine's. Aughnacloy, which is not far from Annaloghan, the birthplace of John Hughes; and in fact, these two were schoolmates in Ireland. A bright and likeable young lad was Terence, with strong religious tendencies which displeased his father, but met with encouragement from his devout mother. In his twentieth year he entered the seminary of St. Sulpice in Paris, and upon the completion of his theological studies was ordained by Bishop de Quelin in 1823. He had quite an important post for his first mission, for he was nothing less than a Parisian curate, serving at the Church of St. Etienne. But it had long been his thought and desire to labor in America, and a year after his ordination he quit Paris and sailed for Philadelphia, where Bishop Conwell received him with great kindness. A few months' service at the stations in Susquehanna County, four arduous years of duty in Reading, and then he came to St. Joseph's in the City as assistant to his boyhood friend. Father John Hughes. He became pastor when the future Archbishop of New York was called upon to found St. John's. His stay at St. Joseph's was conspicuous chiefly for his Sunday school work and his efforts to educate the young men of the parish. Confiding in your piety, prudence and zeal, we appoint you Pastor of the Church and Congregation of St. Michael's in the vicinity of Philadelphia, that is to say, in the Northern Liberties and Kensington; and we declare you in that capacity entitled to the privileges, rights, salary, fees, and other emoluments, of the Pastor of said congregation from the day of the date hereof, until the revocation by us, or our successor, of the present pastoral appointment. Given under our hand and Seal at Philadelphia, the first day of May in the year of Our Lord, one thousand eight hundred and thirty-three. So Father Donaghoe came on the scene when there was already some measure of organization; but there was, of course, tremendous work ahead, the first spadeful of earth had scarcely been dug up. He was not a rugged man, not one suited apparently, either in physique or habit, for the kind of duty here demanded of him. There was the fragility of the saint and scholar about him, an air of refinement which made one associate him with a mellowed civilization. He was in fact a very holy and very learned man. But, though not of robust build, he was not at all sickly, and like most men of his type had an indomitable spirit, was capable of astonishing endurance. He took up his burden gladly, with enthusiasm. He rented a house immediately, a very modest house, on Fourth Street above Franklin (Girard Avenue). It was rather scantily furnished, and one imagines that it was none too well heated in winter. Here he remained until the beginning of the following spring, when the work on the church had so far advanced that he was able to make his residence in the sacristy. In that house two trustee meetings were held; and the first election too, at which, it may be remarked in passing, the rivalry between candidates brought about a slight disturbance. Here he said Mass during the week; on Sunday he offered the Holy Sacrifice with his flock at the home of Patrick McBride. Slowly the church of their dreams and hopes took shape before the impatient eyes of the pastor and his people. There were interruptions in the work, rather long at times, because of continued bad weather, particularly during the hard winter. On March 3, 1834, a trustee meeting was held in the sacristy, where Father Donaghoe had just installed himself. It was then resolved that an organ should be obtained, and an organist engaged, whose salary for the first year should "not exceed one hundred dollars." Whatever may have been the carelessness towards the liturgy and liturgical arts in the American Church of the early days, it is certain that in Philadelphia the music at least was given serious attention. So unbiased a person as John Adams gives testimony of the beautiful execution at St. Mary's. One October Sunday afternoon in 1774 he went there to Vespers in company with George Washington, and that night wrote his wife that "the music, consisting of an organ and a choir of singers, went all the afternoon except sermon time, and the assembly chanted most sweetly and exquisitely"; and in his diary he remarked that "the scenery and music in the Romish Chapel are so calculated to take in mankind that I wonder the Reformation ever succeeded. . . The chanting is exquisitely soft and sweet." A Catholic, Benjamin Carr, became the most celebrated organist of his time in the City; a sacred concert he gave at St. Augustine's in June, 1810, quite eclipsed everything of the kind hitherto offered. He was for a while at St. Mary's, then at St. Augustine's. It was at the latter church that he found the greater interest and encouragement, and here he developed a remarkable choir and gave excellent renditions of Masses of Haydn and Mozart. The one drawback was the lack of a good alto. This circumstance, oddly enough, led to the choosing of a man who was to become rather famous as the first organist of St. Michael's. It is not to be expected or feared that this story will be much concerned with the organists of the parish. They have come and gone so rapidly that it may not be hyperbole to remark that it would take several volumes to say even a little about all of them. Most of them will be passed over in silence. But the history of the first organist is exceptionally interesting. He was William A. Newland - the name will stir the memory of many a music lover. He was born in London in 1813; was baptized at the Anglican Church of St. Giles-in-the-Fields. He went to school at Eton, studied music under Blasgrove of the Royal Academy, and became solo soprano and later solo alto in the boys' choir of St. Paul's Cathedral. His father was a wealthy wall-paper manufacturer, as prosaic as his business, and regarded his son's musical tendencies with contempt. It was necessary to conciliate the old gentleman by doing something "useful", so William took up woodcarving and became so expert in it that he was selected to carve the moulds from which acanthus leaves were to be made for the pillars in Buckingham Palace. He was a romantic youth, so, of course, he fell in love, but unfortunately (or fortunately) with his brother's fair lady, who was a remarkably clever girl for that period, for she managed through many months to keep each of the Newlands in ignorance of the other's attentions. But the inevitable happened. One evening William called unexpectedly and found his brother in the approved position of kneeling suppliantly before the young beauty, so he returned home and forthwith made arrangements to come to America. He arrived at New York in October, 1832, journeyed immediately to Philadelphia, found lodgings with a Catholic family named Dougherty who lived on Arch Street at the lower end. To support himself while he continued his musical studies, he became a paperhanger; which would have so delighted his father had he known it that William would undoubtedly have been left every penny of his money. Mr. Dougherty, interested in the young man, took him to Mass at St. Augustine's one Sunday and introduced him to Benjamin Carr. The wonderful alto voice was like a miraculous answer to the organist's prayer. So Newland joined the choir and studied the organ; was in a little while received into the Church, and married a sweet, young Irish Miss, who made him forget about the double-dealing English lady. Father Donaghoe was a frequent visitor at St. Augustine's, so that when the subject of organist was brought up at the trustee meeting, he knew immediately whom to get. But young Mr. Newland was ambitious, and was to remain at St. Michael's only about a year. He was to move from church to church in Philadelphia, growing always in renown; he was to become a Doctor of Music, a leading figure in the musical life of the city, the composer of hymns, litanies, Masses, and the author of many excellent arrangements. He was to make himself something of a hero by his presence of mind when at a. concert in the Chinese Museum, Ninth and Chestnut Streets, the floor would sag and endanger the lives of his three thousand auditors. He was destined to live to the ripe old age of eighty-eight - and die in so prosaic a place as Roxborough! St. Michael's Church was dedicated Sunday, September 28, 1834, by Bishop Kenrick. Father Donaghoe celebrated the Mass with Rev. Edward McCarthy, S.J., as deacon, and Rev. Patrick Costelloe as subdeacon. Bishop Conwell, very feeble and almost blind, was in the sanctuary; also Revs. Nicholas O'Donnell, O.S.A., and James Cummiskey. Father John Hughes preached the sermon, an eloquent sermon on the Holy Sacrifice, taking Mal. I, 10, 11, as his text; he "was listened to with marked attention, and his discourse was among his most happy efforts." A great crowd attended; many were unable to get into the new edifice. Tickets of admission had been sold for fifty cents apiece, and this with the collection taken up brought a sum of $500.00. notes of its several parts and proportions. . .
"St. Michael's Church is erected on a handsome lot on Second Street above Master Street. It was built in that plain style of Gothic (without buttresses), which, while it pleases by its chaste simplicity, presents no tawdry or misplaced decorations to offend the eye of taste. A large folding door, directly underneath the great front window (which is itself an elegant specimen of the Gothic of the Twelfth Century) opens into a small porch or vestibule, which communicates with the gallery staircase on either side, and the doors leading into the church. Entering by the middle aisle, the attention of the spectator is arrested by the high altar which arises on the opposite side of the building facing the east. It is built in the highest proportions of which Gothic architecture is susceptible in a recess formed by the lateral vestry rooms, and surmounted by a receding arch, which produces the happiest effect in perspective. It is divided into three compartments supported by eighteen clustered columns, which connect a series of concentric arches gradually descending towards the background of the altar-piece, and enclosing a rich and beautiful painting of St. Michael the Archangel, by the celebrated Guido. This painting was formerly in the possession of Cardinal Fesch, the uncle of Napoleon Bonaparte, and was the most admired in his collection of paintings by the first Masters. On the table of the altar is erected a Tabernacle of the most elegant design and exquisite workmanship, which receives and reflects the mellow light that passes through two transparencies drawn over the side windows of the Sanctuary. "From the altar-piece the eye naturally rises to the ceiling, which though constructed in the plainest style of ribbed arches and divested of all ornament, is yet chaste and beautiful - corresponding with the simple, modest design and appearance of the building. The ceiling underneath the gallery is thrown off into arches after the manner of the cloisters and corridors in ancient monasteries. "The orchestra occupies the recess over the vestibule, between the stairs leading to the galleries and completing the uniform appearance of the whole. "Although the connoisseur who admires only what is splendid and loaded with ornament, and cares little for propriety or utility, may, perhaps, desire to behold a specimen of richer Gothic, yet as respects style and execution, he must be, indeed, fastidious who will not be pleased with the tout ensemble of the church. The work is so creditable to the architect that I deem it due him to state that the religious community of Philadelphia is indebted to William R. Crisp for this tasteful addition to our public edifices." There was really no distinctly Gothic feature to the exterior of this church. It was a building of plain walls and round-arched windows and doors. Were it not for the crosses - there was a small one over either side angle of the pediment, and a large one at the apex - it might almost have been taken for a simple auditorium. In this locale of small homes and low, sprawling mills it was imposing, but it would really be too much to say that it was beautiful. Mr. Ralph Adams Cram has said some very harsh things about the American Catholic architecture of this period. It could scarcely deserve all his condemnation. It surely had not "the positive badness of premeditated and accomplished ugliness." That it was greatly lacking in beauty was due to the extraordinary situation in which the Church in America found itself. The Catholic population was growing tremendously, and it was not through the conversion of a people whose edifices could be appropriated, but through the influx of immigrants who had to be cared for immediately. There was no time to cultivate or indulge the esthetic sense; it was a matter of providing the essentials of religion as quickly as possible. Beauty may not be more expensive than ugliness, but it takes time, and requires peace and leisure too; it is certainly not sought or appreciated in a fury of effort to meet a perilous situation. The causes which brought about a decay of art in Europe were undoubtedly operative here, but the reason Catholic art fell lower in America is that the Church was in a holy haste to minister to the ever-increasing multitude. The altar as described in "D's" letter must have been out of proportion, but the altar-piece was the work of a Master. It was probably gotten for Father Donaghoe by friends in Paris. Guido Reni was the most popular artist in Italy in his day, and later his works were in great vogue in England. This painting of his was valued at $3,000 in the claim against) the County for its destruction in the riots; the Court's verdict awarded $1,000. It had the extrinsic value, hardly to be considered by a county court, of having been the property of Joseph Cardinal Fesch, Archbishop of Lyons, and half-brother to Napoleon's mother. But whatever the critics of today would have thought of the church, it was beautiful to Father Donaghoe. It was perhaps even more beautiful to his people. They were thinking not so much of its architectural points, though they knew every detail perfectly, as about what it meant. Here, near their homes, the Holy Sacrifice of the Mass would be offered up day after day, here the sweet Sacred Heart of Jesus would be beating for them in the tabernacle, here their children would be baptized, their sons and daughters married, they themselves would worship and hear the word of God and be brought finally, their dead bodies, for the rite which would reach into eternity to help them. It was to be another home to them, their more sacred home, as the parish church is to every earnest Catholic. They had made many sacrifices, would have to continue to make them, but this was as nothing in their great happiness on this Sunday of the dedication. It was the day which the Lord had made for them, and they were glad and rejoiced therein exceedingly. Men who were to become nationally prominent took part in the founding of St. Michael's. And an organization which has done truly wonderful work for the Faith in the Middle West and is constantly growing, had its birth in the new parish. It is the Order of the Sisters of Charity of the Blessed Virgin Mary, in which there are now 1580 professed religious, 91 novices, 33 postulants, and which conducts two colleges, thirty-nine academies and high schools, and seventy-four grammar schools. It is engaged in educational work in the Archdioceses of Chicago, Dubuque, Milwaukee, Portland, St. Louis, San Francisco; and the Dioceses of Brooklyn, Cheyenne, Kansas City, Lead, Lincoln, Los Angeles, San Diego, Omaha, Peoria, Rockford, Seattle, Sioux City and Wichita. From our ignorant human viewpoint it would seem that if Father Donaghoe had not been well acquainted with that fine, old Irish lady, Mrs. Margaret McDonough - mother of Lieutenant McDonough, and grandmother of a lad in the Military Academy, John O'Brien, who was to be a brevet-major and the hero of Buena Vista, the order would never have existed. At the end of the summer of 1833, five ladies. Misses Frances Clark, Margaret Mann, Rose O'Toole, Elizabeth Kelly, Catharine Byrne, who had conducted a girls' seminary in Dublin, came to the City. They came to Philadelphia because a priest of the diocese called on them and told them of the opportunities here. They arrived penniless because in their glee at nearing land Miss Kelly dropped the common purse overboard. But someone directed them to the charitable Mrs. McDonough, whose home was "in the shadow of St. Joseph's." Here in a day or two Father Donaghoe met them and at once became intensely interested. He was very busy at the time supervising the work on his church, trying to raise funds, but he kept asking himself how these ladies could best be used in the cause of Catholic education. Then quite suddenly he had the vision of a religious order dedicated to teaching, growing out of this little group, and immediately became enthused, for it appealed strongly to his penchant. As soon as possible he consulted them and found that they were willing to enter the religious life. Within a month from their arrival they were installed in a rented house in St. Michael's Parish, and on November 1, the requisite faculties having been obtained, the community was formally instituted and given its title. The new sisters lived frugally and found sufficient support in the revenue from pay-scholars. It is almost incredible that with all his duties and financial worries in connection with his church. Father Donaghoe should have gone about soliciting funds for the erection of a convent. But he really did this; he began it even before the church's dedication. What is more, he did it successfully. Well-to-do Catholics of the City were impressed by his fervent pleas and responded generously. Ground was purchased at the corner of Second and Phoenix (Thompson) Streets, and the Convent of the Sacred Heart was built at a cost of a trifle over six thousand dollars. The Trustees of St. Michael's were invested with the legal title, for Father Donaghoe did not wish it to be held in the name of an individual and the community itself was not capable under the law of possessing property. It may be remarked here that when on November 4, 1844, the County Court granted an indemnity of $6,468.98 for the destruction of this building in the riots, he claimed and actually got the money for the sisters, to whom it rightfully belonged; but several of the trustees who saw only that their corporation held the title and forgot how they had come to hold it, thought for a while, that is, until their memories were refreshed, of compelling him to turn the award over to the parish. A young layman, J. J. E. Norman, who had given splendid assistance to Father Donaghoe in the Sunday school work at St. Joseph's, went to Dubuque to teach in a Catholic school opened there. He spoke to Bishop Loras of the new community founded in Philadelphia, and urged him to invite the sisters to his diocese. Some correspondence ensued, with the result that on June 5, 1843, the bishop, returning from the Fifth Provincial Council of Baltimore, left Philadelphia with five of the community. So this year saw the beginning of the labors of the Sisters of Charity of the Blessed Virgin Mary in the Middle West - labors so sweetly and patiently performed that antagonism was quickly lessened and ridicule silenced, so noble in aim and accomplishment that even the godless must be stirred to admiration at their history, labors so fruitful that the Faith was spread marvelously wherever these good women went. They began immediately to journey over the prairies, visiting and caring for the sick, instructing the children, "spreading abroad the fragrant odor of Christian virtues among a population three-fourths heretics and infidels.” It is not the least of the glories of St. Michael's Parish that it was the birthplace of this magnificent sisterhood. But to get back to the pastor and his flock, after the dedication of the church they had a debt of $22,028.00 to worry about. In the United States Gazette of March 18, 1835, appeared a notice that St. Michael's R. C. Church and its lot would be sold by the sheriff on May 4. This announcement was the result of a certain O'Toole's having recourse to law because his bill for plastering had not been paid - one would judge by his name that he was Catholic, and by his action that he was the type of Catholic who would sell his religion at any time for personal gain. However, Mr. O'Toole got his money and the advertised auction was never held. Not only was the debt gradually reduced, so that by January 1 of the fateful 1844 it was only $10,000, but many improvements were made during these years. Pews were erected in the gallery at a cost of $400.00, and it was from the rental of these that the first assistant. Rev. William Whalen, was supported. An organ was purchased for $393.00. $716.00 was spent in laying curbing about the property. The altar-piece was retouched for the little matter of $200.00. Alterations were made in the choir-loft, and additional plastering was done - but not by O'Toole. Indeed, more ground was purchased from the estate of William M. Camac to extend the cemetery, and north of the church a commodious rectory was built in 1839, costing more than four thousand dollars. Written out in the ledger and book of minutes, it is a cold record; but we understand - do we not? - and we turn from the figures and the simple statements and conjure up the picture of the Catholic group centered about the church, loving it, proud of it, giving far more generously than they could afford to beautify it, and we find more pathos in this happy and confident striving than in their affliction when they came later and looked upon its ugly ruins. There were other changes of a different nature during this decade. On February 12, 1835, the Supreme Court of Pennsylvania granted an alteration in St. Michael's Charter, giving the appointing of trustees to the bishop or other ecclesiastical superior having jurisdiction over the diocese. There had been no trouble of any kind except the very trifling disturbance at the first election, but Bishop Kenrick was mindful of the danger in lay control and wished to reduce it to the minimum. The first assistant came to the parish in 1838, Father Whalen, who had been with Father Donaghoe at St. Joseph's years before. And what is most important, in October, 1843, that is four months after Bishop Loras left with the five sisters. Father Donaghoe made up his mind to take the rest of his community - it had grown in the ten years to the strength of fourteen members - to Dubuque. He informed the trustees of his intention, told them it was unlikely that he would return to St. Michael's, and asked them to purchase certain personal property which he could not readily remove. To all intents and purposes he resigned his pastorate, and this is to be kept in mind when the account of the riots is being read. He and the sisters arrived at Dubuque on October 18, 1843. Two postulants remained behind to care for the convent until some disposition could be made of it. It is opportune now to summarize briefly the remainder of Father Donaghoe's career. He was in Philadelphia at the time of the riots, as we shall see, having returned in March, very probably to see what could be done with the convent building and to obtain his exeat. Afterwards he again took up the duties of pastor in St. Michael's Parish for a brief period, in order to be in a better position to press the claims of the congregation against the County for the destruction wrought. Then he went back to Dubuque and shortly became vicar-general of the diocese. Other, bishops wanted this learned, indefatigable priest; Hughes often urged him to come to New York, and Quarter tendered him the presidency of a contemplated college in Chicago. But his heart was with his community of religious; he wished to be near them to watch over their development. His friendship with Bishop Hughes, however, was always intimate. It is said that it was at his suggestion that the bishop proposed to the Sixth Provincial Council of Baltimore the choice of the Blessed Virgin Mary under the title of. the Immaculate Conception as the Patroness of the United States. They journeyed to Rome together in 1850. Father Donaghoe died at Dubuque January 5, 1869. His successor at St. Michael's, the one who was really pastor from the beginning of October, 1843 on, was the Rev. William Loughran. He had taken Father Whalen's place as assistant in 1841. Let us see who served as trustees, however briefly, in that period from the day of incorporation until the burning of the church, for they were in a special way the pioneers of the parish. They were: Rt. Rev. Francis Patrick Kenrick, Rev. John Hughes, Rev. Terence J. Donaghoe, Rev. William Loughran, Henry Crilly, John Waters, Adam Miller, Patrick McBride, Hugh Clark, William Browning, Edward Keenan, Michael McGill, William Snyder, John Reilly, Michael Keenan, Bernard Maguire, Francis Brady, Valentine Glenat, Peter McAleer, William Lloyd, Charles Clark, Patrick Walsh, Dennis McCrystal, Nicholas Crangle, James Johnson, and Isaac Mullin. The bones of many of them rest in the old graveyard behind the church. So the priests and people of St. Michael's built and adorned the House of God, were happy to make sacrifices for the Faith, had one common thought and hope, which was that through them the truth and beauty of their religion might be revealed, went quietly - these things can be said of them in general - about their daily tasks with hearts, in which reigned the peace of Christ, gave no offense, were rather indifferent to the hostility around them - like the peasants of Sicily who with light hearts till their gardens, trim their vines, sing their songs in the very shadow of Aetna. And all through these years which had brought progress so satisfying and encouraging, the storm clouds of bigotry had been gathering until now they were black and terrible, and the fury which would make them wanderers without church or home was about to break upon them.